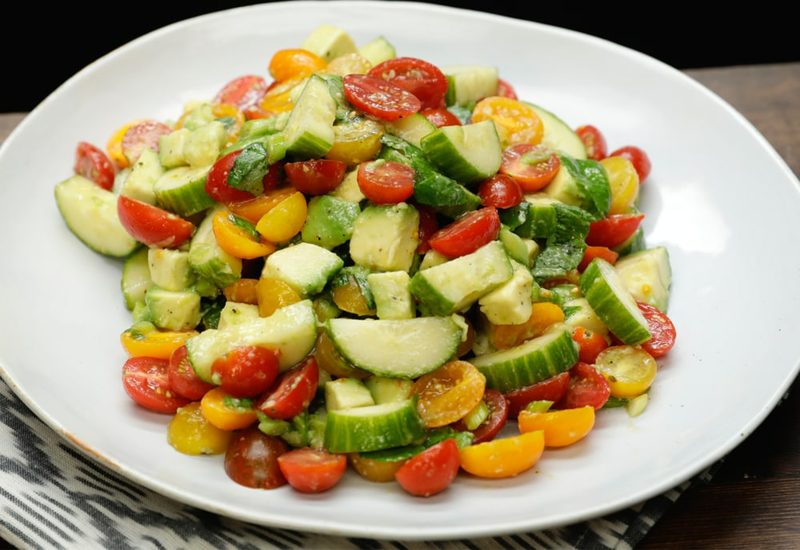 A simple mix of cherry tomatoes, cucumber, green onions, avocado and basil is about to become your new favorite warm-weather salad. Make this when summer vegetables are at their peak—it's dressed with just a little olive oil and lemon juice, really letting the flavor of the vegetables shine. English cucumbers are sweeter and have fewer seeds than standard cucumbers; use four Persian cucumbers instead if you like. You can also use a pound of large heirloom tomatoes, chopped into pieces—there will just be more juice than if you use the cherry varietal. This summery salad is best served just after it's dressed, but you can make parts of it ahead of time. Cut the tomatoes, cucumbers and green onions and place in a large covered container and refrigerate for up to two days. Just before serving, toss with avocado, basil, lemon juice, oil and season. Per Serving: 212 calories; 18g fat; 14.7g carbohydrates; 3g protein; 0mg cholesterol; 544mg sodium. Fresh, quick and easy. This salad, paired with a chicken breast was a full meal unto itself! This was a delicious salad! I made it for an impromptu get together at my house and everyone raved about it all night. Instead of lemon I added a little lime juice because that's all I had on hand, and it worked nicely. This is going to be my new go-to salad for casual gatherings. I made this salad for a casual party at my house and my guests loved it. I prepared the salad ahead of time, as suggested. I waited until it was time to serve before I cut the avocado. I also used three avocados instead of two. I used the red cherry tomatoes, Persian cucumbers, green onions, and extra avocado for this salad. I took it to the beach for my little picnic with a few friends. I made the olive oil dressing and put it in a small container until I was ready to eat the salad. Perfect! Heirloom tomatoes worked perfectly for this recipe. I prefer them to cherry tomatoes because of how much juice they contain. I used lime juice instead of lemon, just seemed like a better fit with the avocado. I also garnished with cilantro. Very good salad.